I am on the MyVegas app on facebook. Used the two spring nights at Aria reward and paid for a third night. After a three hour flight delay and a death defying cab ride, we got to Aria shortly after midnight. We did not target any clerk, just the next available one. We gave the young (25-30) front desk clerk my id and credit card, along with $40 and said if there is anything you can do. She said she would do what she could (I got the impression she had some management clout). I was not going to try based on internet research but my wife said it would be good karma. The clerk got on the phone and then said “wait until you see what you get”. Upgrade to Aria Sky Suite! I gave her an extra $20 because I knew what was in store. Best hotel room I have ever seen. So for $149 one night plus three nights resort fee + $60 we stayed in the Sky Suite for three nights worth $2000. A very epic (for us) vacation. Just pulled out the $20 while checking in and as I put it down on the counter I said it was my wedding anniversary and asked ih there were any complimentary upgrades. He looked at the $20, went and talked to his manager and came back and siad he could upgrade me to a room overlooking the strip. I booked regular Deluxe King Room. As I was staying with my brother, I asked at the reception if it would be possible to get Queen instead of King. Clerk started calling somewhere, took him like 5 minutes. In between he asked if we were staying just one night. We confirmed that. From there it was little confusing, as he said that he was able to get us one of Sky Suites. We went to seperate elevators where in a part where the Sky Suites are located, our room was on floor 54. Even though on the key cards, door of the room and accessories in the room (such as toileteries, note pads, pens etc.) it said Sky Suites, the room was just a little bit bigger than regular Deluxe Room, but was decorated as Sky Suite. Also had a nice strip view. I was trying to find the room online but they aren’T offering it there. Don’t really know what exactly we got upgraded to, but most certainly it wasn’t regular Deluxe Queen. I came to the Aria for the last weekend of July 2018. Overall I am a pretty straight up guy. I was in the line and was greeted by a young man who was in his mid 20’s. 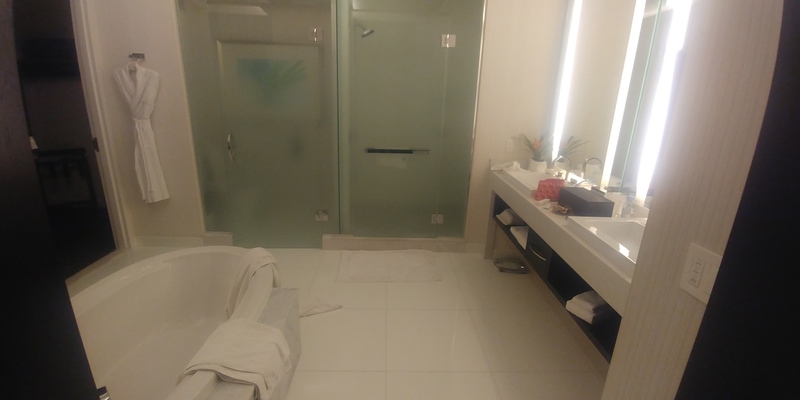 I gave him my passport and credit card, however at the same time I put a $100.00 bill on the counter and advised him up front that if he can give me a comp upgrade to a corner suite this will be for him. His eyes lit up and he said let me see what I can do for you. 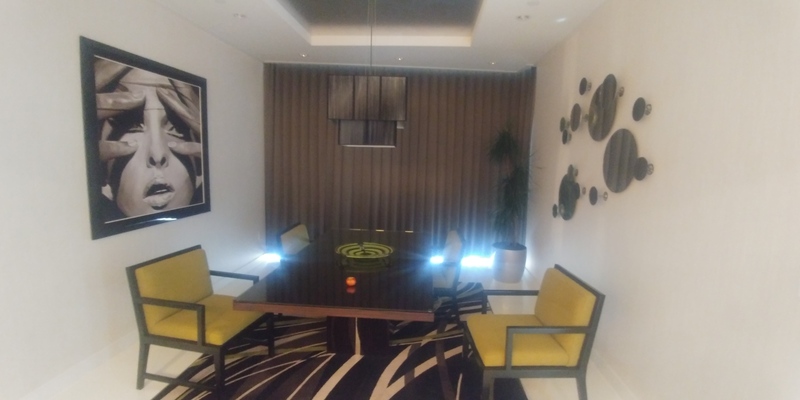 He check with his manager and came back to me 5 mins later and told me that my corner suite was ready but I would have to pay 100 bucks per night. I told him that I was not looking for that. 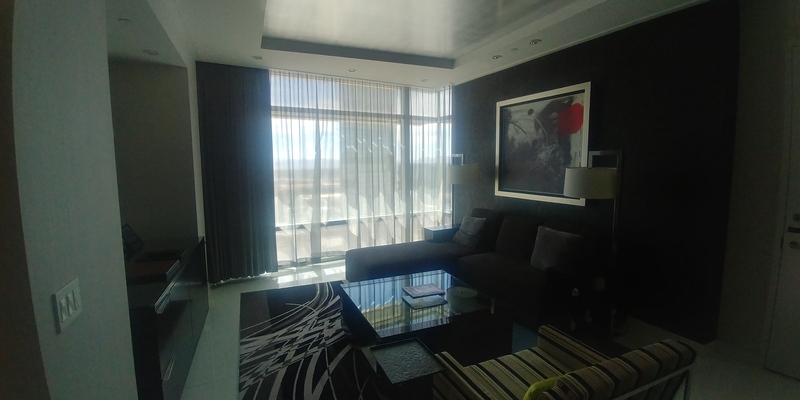 He advised me that he can only give me the standard size room but he can give me a 50th floor with a view that was the opposite end of the stripe, plus another $75.00 resort credit. I told him straight up that I would still take care of him but not for $100.00. In the end I took his offer and tipped him $30.00 instead. I checked in around 11:30a at the priority desk because I had platinum status. He asked me if I was interested in an upgraded. I said yes and asked if their was any suites available, while I presented him with my ID, cc & & $50 sandwich in between. Note I did my homework. I checked online the night before to see what was still available. Every level of rooms were still available. So the desk clerk played around with his key board for a few minutes after he said I need to check with a manager. After a few minutes he offered the same room type higher floor with a view. 2nd note I used Priceline express deal for the room, maybe that factor in my less than acceptable “upgrade”. Although I’ve also use Priceline and gotten great upgrades. I came to Las vegas for superbowl weekend 2018. I stayed 3 nights, I went to the hotel counter and advised the clerk that I am checking in. I gave him my passport, credit card and a $20.00 bill. I ask him if he had any upgrades for me? all I wanted was the same room size with a strip view that’s it!!! he took my money and put it aside and started checking. Then he adivsed me that he needs to talk to his manger first. Before that I told him that I am in Vegas for my friend’s birthday weekend I am have stayed at Aria before. he came back and told me he cannot upgrade at all. But what had me upset was he didn’t even bother giving me my $20.00 back. So then I asked if he can provide me any buffet comps? then he said no. In my mind I wanted to tell him give me back my $20.00. But then in the end I didn’t want to cause a big scene over $20.00 so i just left it as is. I did the $20.00 tip trick before and I would assume that if they can’t upgrade you then the Hotel clerk is suppose to give your $20.00 back. I guess not. Denied…I could pay $50 a night and get a nicer room, but I thought the idea was that the cash up front took care of that. I was given the money back. 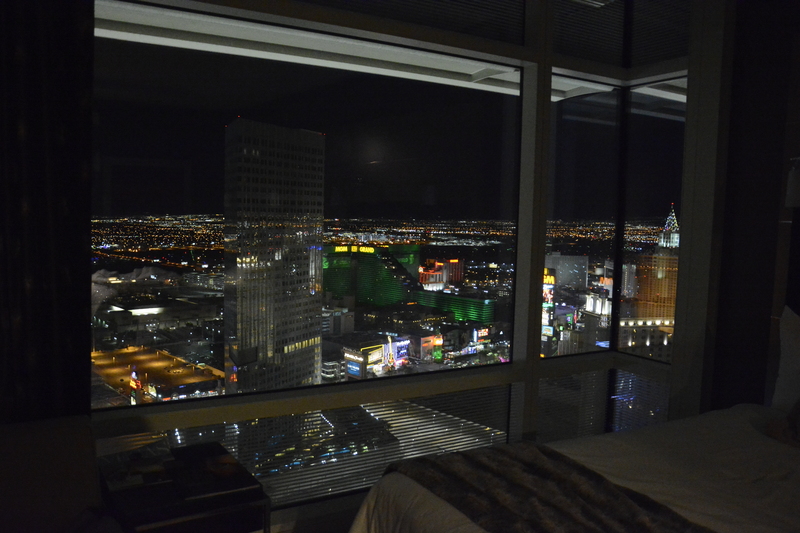 Learn how you can get hotel room upgrades by using the famous $20 dollar trick at the Aria hotel and Las Vegas casino. 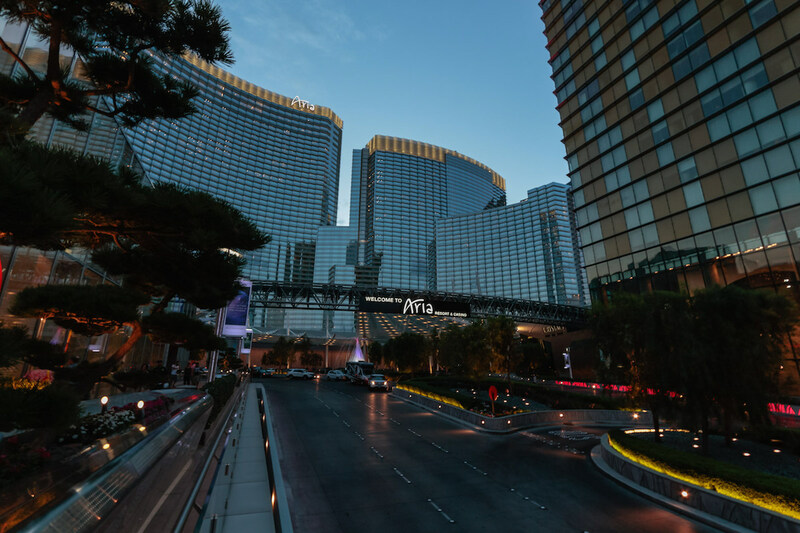 Above, you can read real stories of visitors that have done the twenty dollar trick when checking in at Aria to get room upgrades.